The red object appears to be a planet orbiting the brighter (but still relatively dim) brown dwarf star, seen here as blue-white. 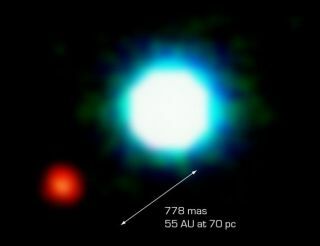 A group of European-led astronomers has made a photograph of what appears to be a planet orbiting another star. If so, it would be the first confirmed picture of a world beyond our solar system. "Although it is surely much bigger than a terrestrial-size object [like Earth], it is a strange feeling that it may indeed be the first planetary system beyond our own ever imaged," said Christophe Dumas, an astronomer at the European Southern Observatory. SPACE.com revealed a similar imaging effort of another planet candidate in May by a U.S.-led team that used the Hubble Space Telescope. That possible planet has not been confirmed and could be a dim star in the background of the picture. Otherwise, all of the more than 120 known extrasolar planets have been detected indirectly, by noting the shadow of a planet crossing in front of a star or a planet's gravitational effect on a star. Because planets are so dim compared to stars, technology has not been able to spot them amid stellar glare. The new picture shows a dim, red point of light that Dumas and his colleagues think is a young, giant planet something like Jupiter. It orbits a failed star known as a brown dwarf, a very dim type of star -- its core does not support nuclear fusion -- that astronomers have for years hoped would make for good planet hunting. The brown dwarf, catalogued as 2M1207 and just 8 million years old, is 42 times less massive than the Sun, or some 25 times heftier than Jupiter. The setup is 230 light-years away. The possible planet is about five times as massive as Jupiter, the observations show. An analysis of its emissions found it contains water, which suggests its mass is in the range of planets rather than stars, the researchers announced today. The object is still contracting into its final form and so is very warm, some 1,830 degrees Fahrenheit (1,000 Celsius), according to the research team, which was led by ESO's Gael Chauvin. The photograph was made at ESO's Paranal Observatory in Chile with an infrared camera, which records heat rather than visible light. A system of adaptive optics on the Very Large Telescope (it's 27 feet wide, or 8.2 meters) corrects for blurring effects of Earth's atmosphere, making detailed observations possible. The discovery will be detailed in the journal Astronomy & Astrophysics. If it is a planet, the object orbits 55 times farther from the brown dwarf than Earth is from the Sun, or roughly twice the Earth-to-Neptune distance. One remaining question, however, is whether the thing might instead be a star that's in the foreground or background and not gravitationally bound to the brown dwarf, a scenario the researchers say is "statistically very improbable." Additional observations to monitor the movement of the two objects will reveal the answer within two years, the astronomers say. In separate work, Ray Jayawardhana of the University of Toronto has been studying the brown dwarf in question, 2M1207. He agrees that the newfound object is most likely in orbit around the brown dwarf. It could be a very dim brown dwarf in the foreground, he said, but that's doubtful. The water found in the atmosphere, in the form of steam, "means it would have to be pretty cool and couldn't possibly be a star," Jayawardhana told SPACE.com. Jayawardhana's team found that 2M1207, like a real star, has a surrounding disk of hydrogen gas, the leftovers of the brown dwarf's formation. But in contrast to how planets probably developed in our solar system, he does not think the planet was born out of the brown dwarf's disk. Instead, the planet and brown dwarf likely "formed together out of a clump of gas and dust," he said. Another unsettled issue is whether an object of five Jovian masses is truly a planet. Some astronomers put the upper limit for planetary mass at 13 times what's in Jupiter. Others argue that a planet is must orbit a star and have formed out of its leftovers. There is no official definition for the term "planet." Jayawardhana doesn't care what the new object is called, it is still very interesting from a physics perspective. "This discovery opens up a whole new regime of objects for us to look at and learn about," he said. What Might the Planet Look Like?